Introducing Sleep-O-Max™, the new definition of a great night's sleep! It's our most advanced sleep formula to date! It provides you with four of the best nutritional sleep support ingredients to be found. Valerian Root (extract and powder) and Passion Flower powder (from the leaf and plant) provide support for night time anxiety and insomnia. We've included melatonin. Normally, the body supplies its own melatonin. It's triggered by the withdrawal of light from the eye's optic nerve. If you don't have enough available or you disrupted your sleep cycle (due to travel or unnatural sleep aids), it's another reason why Sleep-O-Max should be your choice! L-Tryptophan is an amino acid. While it is contained in some foods, you may not be getting enough. This is especially true if you have been told to avoid meat and dairy or you are a picky eater in general. L-Tryptophan is so important because it is a precursor for melatonin, thus you get melatonin to support sleep immediately and L-Tryptophan to support the production of Melatonin! 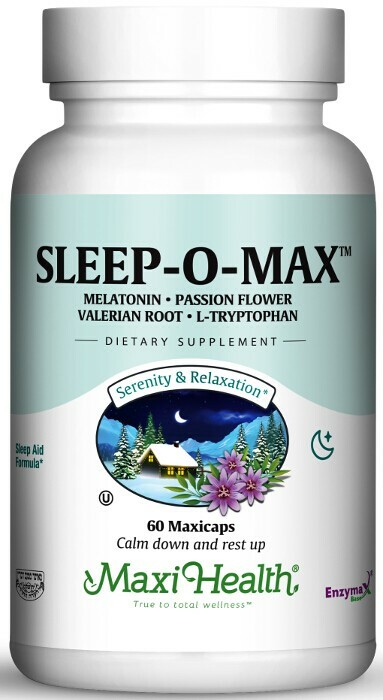 Having trouble sleeping Make Sleep O Max™ part of your night! Other Ingredients: Other Ingredients: Vegetable cellulose, rice flour, magnesium stearate, Enzymax® (calcium carbonate, bromelain, papain, lipase, amylase, protease, silica). This product contains NO animal products, wheat, sugar, soy, salt, yeast, gluten, milk, artificial flavors, colorings or preservatives.